Once development got going on the Upper West Side, it steamrolled. Beginning in the 1880's developers filled entire block fronts in a single sweep with harmonious homes designed by a single architect. The West Side residences, designed mostly in expressive historic revival styles were replete with turrets, gargoyles, dog-legged stoops and stained glass windows. They bore no resemblance to the Parisian-inspired palaces of the Upper East Side. Developer-building John C. Umberfield joined in the building boom by purchasing the black front of 105th Street between the newly-completed Riverside Drive and West End Avenue. He commissioned the architectural firm of Janes & Leo to design a striking row of high-end residences that would stretch from No. 302 to 320. The firm had just completed The Alimar around the corner at No. 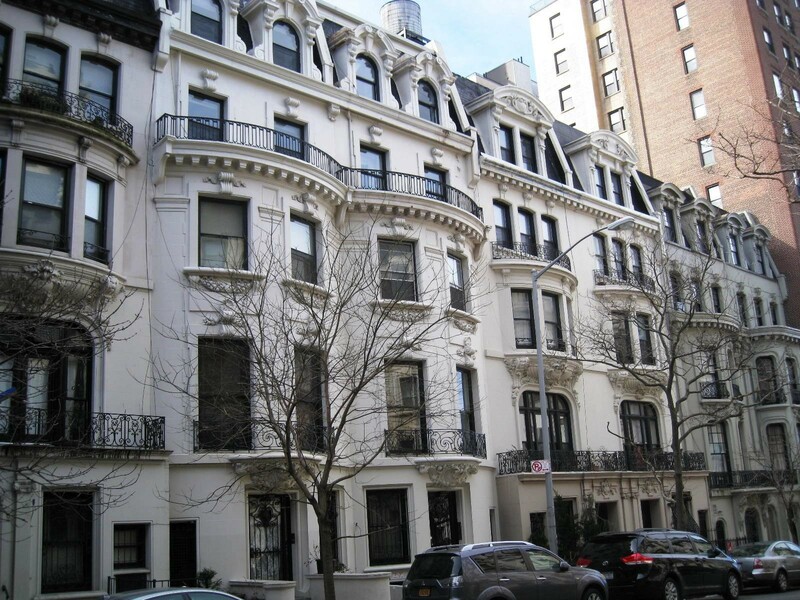 925 Wet End Avenue, an exuberant high class apartment building in the Beaux Arts style. For Umberfield's string of homes, the firm would turn to the style again, creating a row of French-influenced mansions much more akin to their across-the-park cousins than their brick-and-stone West Side neighbors. Construction began in 1899 and the row was completed a year later. The homes were all highly similar, but discreetly individual. The mansions were grouped in twos with each pair being nearly identical. By arranging the row this way, the architects accomplished a harmonious flow and a sense of balance. The row was designed as three pairs, No 312 being second from left. The completed residences were offered for sale in 1900 for between $42,5000 and $50,000--just over $1 million today. Umberfeld sold No. 312 to Charles de Corvova in April 1901. Born in London in 1854, de Cordova was the sole proprietor of De Cordova & Co., a tea brokerage company. The Trade Journal's All About Tea called the firm a "leader in the American tea trade." Charles de Cordova in his later years. from All About Tea, 1935. De Cordova was, indeed, a leader in his business. In 1895 he had pushed for a "tea law" and was greatly credited for the passing of the 1897 Tea Importation Act which banned the importing of tea contaminated by pesticides, metals, and the like. In 1918 his shipment of Japanese tea on the S. S. Tsushima Maru was the first tea shipment to pass through the Panama Canal. A respected member of social and business clubs, De Cordova proved his novel decorating skills shortly after buying the 105th Street mansion. The Virginia newspaper the Richmond Planet reported on June 1, 1901 "A new idea in table decorations was evolved by Charles De Cordova in a dinner given by the New York Athletic Club to P. R. Todd, recently elected to a vice presidency of the New York, New Haven & Hartford railroad. In the center of the table was a large bank of roses, around the edge of which was constructed a miniature railroad, on which a locomotive, baggage car and passenger coach, operated by electricity, whirled about the table at a speed of about 50 miles an hour." Focus turned from business to social interests in the spring of 1906. The mansion was the scene of the wedding of the de Cordovas' only child, Fanny, to Dr. John W. Sanborn of Boston. The ceremony took place on April 18, 1906. The de Cordovas routinely summered in either Stockbridge, Massachusetts of Lakewood, New Jersey. They took a break from the New York winter in 1907 by traveling to Kingston, Jamaica. Their vacation amid palm trees and tropical breezes was horrible and tragically disrupted when a massive earthquake rocked the island on the afternoon of Monday, January 14. Every building in Jamaica was damaged and, as had been the case less than a year earlier in San Francisco, fires erupted throughout the city. An estimated 10,000 people died. The Washington Times reported on January 17 "not less than $10,000,000 of her property [is] wiped out." The newspaper listed among the injured Charles de Cordova and among the dead, his brother Edward. Charles's wife, the former Ella Nichols, involved herself in several organizations, including the Women's Guild of St. Luke's Church and the School of Domestic Art and Sciences, of which she was treasurer. 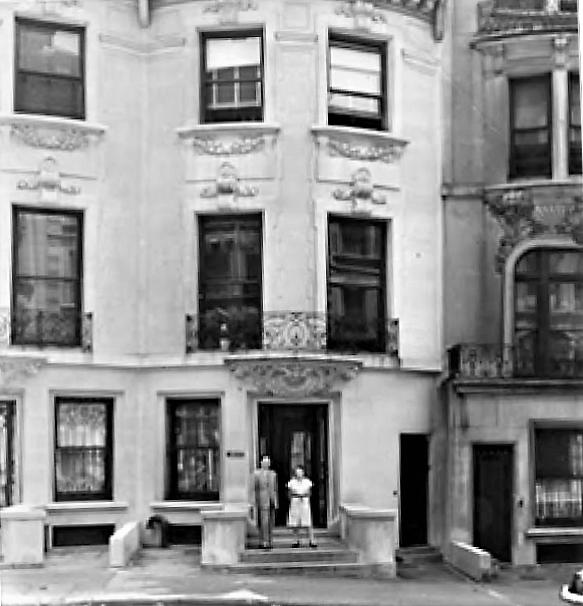 The couple left the West 105th Street house in 1925. They moved into the Belnord apartments on West 86th Street. They had been married 45 years at the time; but their domestic bliss was about to come to an end. Throughout their marriage Charles had turned over his "surplus earnings" to Ella for living expenses and to invest. 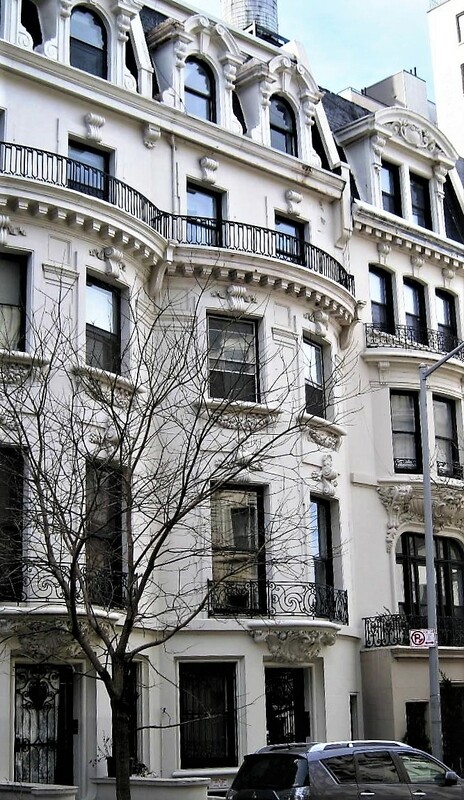 While living on 105th Street his average income was about $245,000 by today's standards. On August 22, 1929 the aging Charles sought an injunction against Ella, who was 72, to restrain her from disposing of their life savings. Charles asserts in court that their son-in-law, Dr. Sanborn, had "maliciously influenced" Ella to move all the securities into he own name; presumably with the goal of gaining control. De Cordova lamented that Sanborn had destroyed the happiness of his home "and the comradeship of his wife for forty-eight years" and that he had "been stripped of all his savings of these years and is left at the age of 75, with a broken home and less than $11,000 in securities which he happened to have in his own custody." The ugly court battle continued for weeks. In the meantime, Robert Davison Petty had purchased No 312 from the de Cordovas in 1925 for $31,000, about $433,000 today. Petty had been appointed dean of the New York Law School the year before; prompting his resignation as Assistant District Attorney. Born on a farm in Washington Township, New Jersey, it was a farming accident which resulted in his conspicuous change in career paths. As a young man he was cutting down a field of corn when the scythe slipped and severely cut his knee cap. The injury prevented any further physical labor. While he convalesced he decided he would like to become an attorney. In 1883 he graduated fifth in his class at Princeton University. Two years later he graduated from the Columbia Law School and would later become that school's Professor of Law. Petty's wife was the former Florence Servis. The couple had seven children--Alice, Robert, Mary, Elizabeth, John, Katharine, and Richard--four of whom lived in the West 105th Street house with their parents. On the night of June 2, 1932 Petty personally awarded degrees to 124 graduates at the commencement ceremonies of the New York Law School. Upon retirning home, the 72-year-old chatted with his son-in-law, Ray Bouton, about his youth and said he would like to go back to the farm some day to live out his remaining years. The following morning he did not come down to breakfast at the normal time; but the family assumed that he had overslept after the strenuous night. At noon daughter Elizabeth went up to waken him. She discovered he had died in his sleep. His funeral was held in the house the following Monday. On December 10, 1937 son Richard Servis Petty married Marcille Littlefield in the West End Presbyterian Church. Richard had followed in his father's footsteps and was also a lawyer. The marriage did not reduce the population of No. 312, but increased it. The New York Times noted "Mr. and Mrs. Petty will live at 312 West 105th Street after a trip to Canada." Daughter Katharine's wedding seven months later was held in the family home. Katharine, like her siblings, had enjoyed a privileged upbringing. She attended the Ethical Culture School, graduated from the Horace Mann School for Girls, and Miss Hunter's School. She married Alvah Howard Lance on July 16, 1938. No. 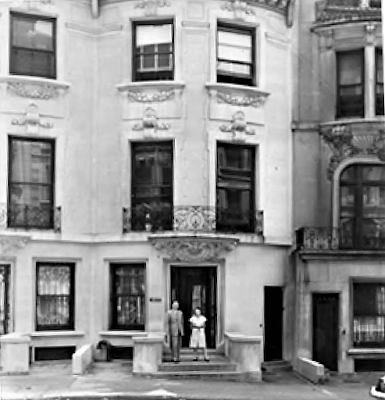 312 West 105th Street was sold on August 20, 1945. Florence would survive until February 8, 1960, having outlived not only her husband, but daughters Katharine and Elizabeth. The house had become home to a Jewish doctor from Hungary, Laci Klein and his wife, Ansci, who had recently escape from almost certain death in their homeland. Once here, according to Judy Cohen in her Song of the Silent Bell, as Klein's siblings escaped the Nazi regime, he provided them a place to live. Ansci's family was tragically lost to the Holocaust. In 1952, upon becoming naturalized citizens, the Kleins changed their surname to Kay. The remained in No. 312 until early in 1956. In 1962 the former mansion was converted to a doctor's office in the ground floor, and eight apartments in the upper stories.